As a structural engineers, we are always working on existing buildings. Most of the time we scan the as-built files or obtain those from owners. Most of the times, the scanned pdf files are really difficult to work because those are big and slow. Following menu will pop up. 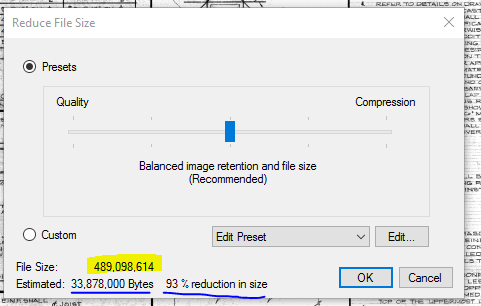 Compress the file as much you want. 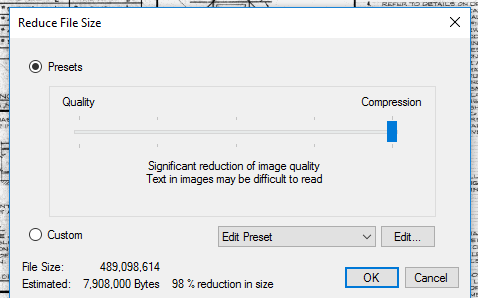 The text at the bottom will tell you the Estimated size of the file and reduction in size. For Scanned files, I usually go to full compression and the quality of drawing is not reduced. But you can try different settings for your project. Note the file size below: from 477 MB to 43.3 MB file. Also the pdf is very fast to use now.